Our next tip for creating an attitude of gratitude in your child involves being thoughtful with money. Inviting children to learn about money can be a good idea for teaching practical math skills and complex concepts like buying, selling, and earning. 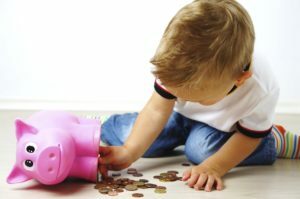 Allowance: Debating whether to give your child an allowance? Giving children an allowance, perhaps just small change given once a week, can help them to start thinking more about saving and spending. Having a healthy relationship with money, saving, and spending starting early could help teach children the value of a dollar. Smart Purchases: Wondering what to do when your child begs for toys? Instead of saying a flat no, give children a budget you feel comfortable spending and say they can choose one or multiple items within their budget. Depending on the age of the child let them look into reviews of toys or quality reports. Take them to the store to try toys out before making any decisions. Going through these steps teaches children there are multiple aspects to consider when deciding to make a purchase.